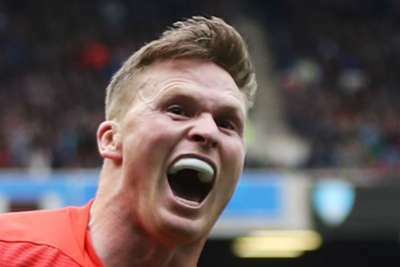 Chris Ashton set a new try-scoring record for a Top 14 season in a 32-17 victory for Toulon over leaders Montpellier and Oyonnax beat Brive in the battle of the bottom two on Saturday. Former England wing Ashton made history by scoring his 22nd try of an outstanding first campaign in France early on at Stade Mayol, racing away to dive over after taking a pass from Ma'a Nonu. The ex-Saracens flyer bettered Napolioni Nalaga's long-standing tally and set his side on the way to a triumph which leaves them eight points behind table-toppers Montpellier. Semi Radradra, Mathieu Bastareaud and Facundo Isa also went over in the first half, with a converted Vincent Martin try all Montpellier could come up with as they went into the break trailing 29-7. Gabriel Ngandebe and Kelian Galletier touched down after the interval for Vern Cotter's men, but the damage had already been done. Oyannax leapfrogged Brive in the table with a 40-17 victory at Stade Charles Mathon. Ben Botica scored 20 points, including Oyannax's only try of the first half, and Valentin Ursache claimed a second-half double as the home side enhanced their chances of avoiding the drop. Oyannax are only four points adrift of Stade Francais, who suffered a 44-3 battering at Lyon, while Agen eased their relegation fears with a 33-22 win at Pau, Filipo Nakosi scoring a hat-trick, and Clermont Auvergne thrashed Bordeaux Begles 33-3.